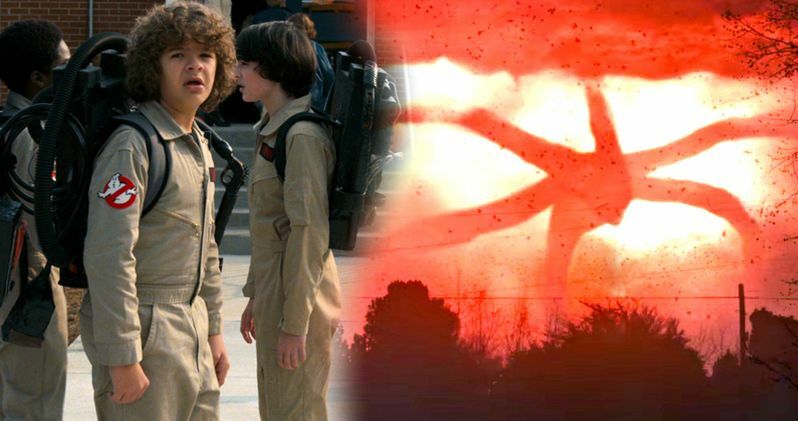 New details have emerged about Stranger Things Season 2, and apparently it's going to be even more horrifying than Season 1. Stranger Things seemed to come out of nowhere when it hit Netflix last summer, and in addition to picking up accolades, it also picked up all-new run of episodes. Now that it's May 1st, we have 6 more months to go until we get to see the release of Stranger Things Season 2 (unless it gets leaked)...Previous news from the cast at New York Comic Con revealed that this next season is going to be "insane", and that Barb is indeed dead. But today, we get a few more morsels of info. People Magazine has the main cast on the cover of its Emmy magazine, due out May 17th. But the magazine has teased out some information from their interview. One thing that is apparent, is that we won't be gaining any plot details. We do know that Stranger Things Season 2 will take place exactly one year after the end of season 1, with the return of Will from the Upside Down. Gaten Matarazzo, who plays Dustin, has some deep insight into the intense character development for season 2, which he shared with the magazine. Matarazzo had this to say. "The great thing about this season is you get to see insights into each character on their own. You're going to see a lot more into the lives of how the characters are coping with what's been going on. I think they're all very emotionally scarred. They feel alone because their best friend [Will] is back and he's not acting like their best friend anymore. He's changed." Will indeed has changed. At the end of Stranger Things Season 1, Will, who is played by Noah Schnapp, was barfing up slug-like creatures in the bathroom. Which is more than a subtle hint that something may be wrong with the gang's old pal. This could mean any number of things, but it really looks like Will brought some of the Upside Down back with him, and he's trying to keep it under wraps from his friends and family. Finn Wolfhard, who plays Mike, had this to say about the show dealing with darker elements than season 1. "There are going to be some challenges that the characters face that are real. That are disturbing. I think this season will be a lot more dark. A lot more horror oriented. I think people are going to like it more than the first season." Stranger Things, created by Matt Duffer and Ross Duffer, debuted in July of 2016 on Netflix and within days, fans were already wondering about a second season. The show took place in the 1980s and did a wonderful job of hitting all of the tropes of an 80s film without being to heavy handed. The show mixed nostalgia with an amazing cast of young actors and actresses who became breakout stars seemingly overnight. The show reportedly became the third highest streamed program on Netflix at the time, behind Fuller House and Orange is the New Black. Ok, so 6 months to go for the even darker Stranger Things Season 2. While no official plot points are given, we can surmise that something will have to involve the return of the Upside Down through Will and there will probably be Eggo frozen waffles, a lot of them. The show also stars Millie Bobby Brown as Eleven, and Caleb McLaughlin as Lucas. Stranger Things Season 2 will bring us a lot of new characters as well. The new episodes will officially arrive to stream on Halloween night.